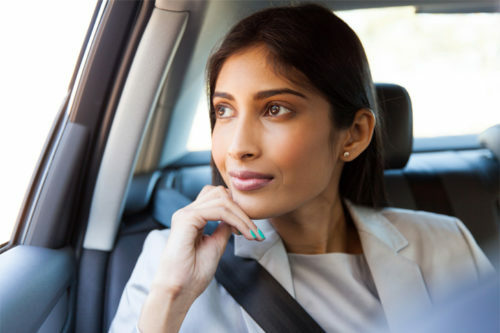 India has a reputation for producing gorgeous, colorful textiles; it helps that many of its fabric-making traditions date back thousands of years. If you’re visiting the Subcontinent in the hope of bringing back bolts of artisan-made cloth, be sure to set aside some time for fabric shopping in Jaipur. The Rajasthani capital is justly famous for its hand-woven, -dyed, and block-printed fabrics, which are made by skilled craftspeople. On your next trip to the Pink City, explore the following boutiques and workshops (and prepare to leave with armfuls of scarves, shawls, saris, and more). Though it now has branches across India and internationally, Anokhi is first and foremost a Jaipuri brand, with decades of history behind it. 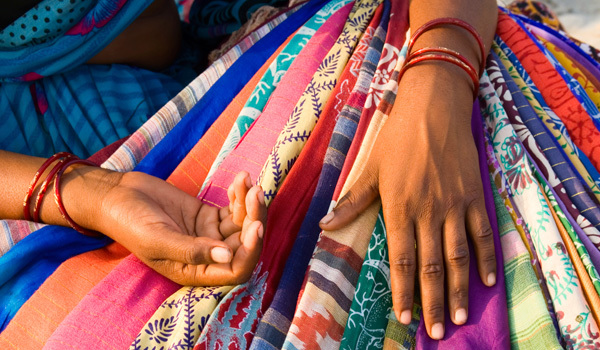 Anokhi works closely alongside artisans skilled in block printing, as well as appliqué, embroidery, and other techniques, to produce its striking textiles and clothing. 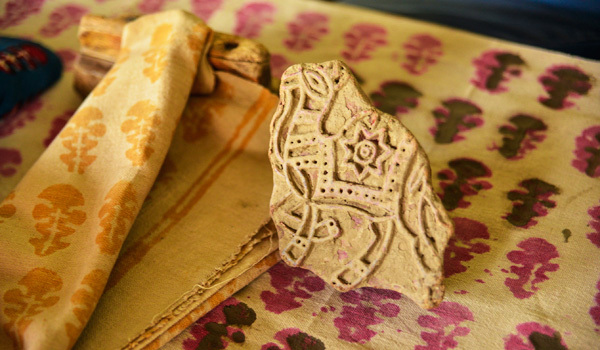 Once you’ve browsed the flagship shop, you can also venture to the Anokhi Museum of Hand Printing, located adjacent to the Amber Fort in a restored haveli, where you’ll learn more about the traditional methods that have made the city’s textile reputation so enduring. When fabric shopping in Jaipur, head to Rasa for textiles that blend traditional practices with more modern applications. The well curated boutique stocks a range of fabrics for the home, including pillows, bedding, and other linens, as well as its own line of vibrant clothing. 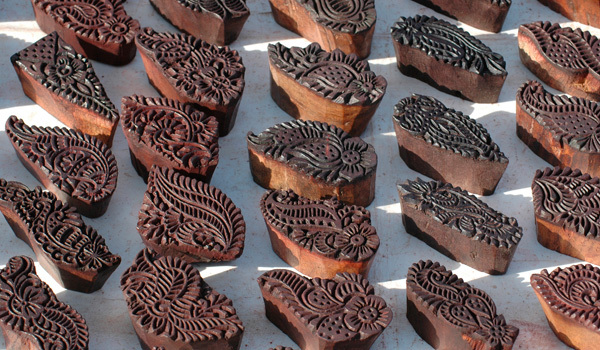 While products are made using traditional block printing techniques, the use of ombre and other more modern dye methods keeps styles looking current. A destination for textile-hunters in Jaipur for decades, Kin Fabrics has earned a reputation amongst shoppers in the know for its high-quality, thoroughly traditional pieces. One of the shop’s prime focuses is bed and table linens, which are printed in an array of eye-catching patterns. Traditional salwar kameez and other Rajasthani clothing is also a specialty. Like Anokhi, Kilol is another Jaipuri brand that has since found legions of textile fans across the Subcontinent. For the sharp-eyed fabric hunter, though, its Jaipur shop is still the one to visit. A local presence for more than two decades, Kilol prints and dyes all of its fabrics in-house, with the help of area artisans. The end result is a range of modern-meets-traditional products, including everything from tunics and saris to quilts and cushion covers. 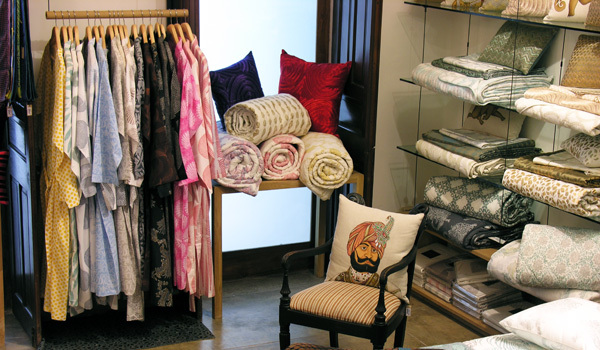 Founded in 1984, Soma is another must-visit for anyone going fabric shopping in Jaipur. 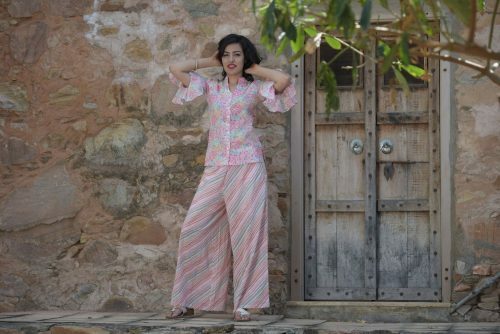 The brand has remained faithful to the block-printing traditions of the region, and employs a number of artisans to produce its nature-inspired designs, which are printed using traditional hand-carved wooden stamps. Its selection is wider than many: the flagship boutique includes clothing lines for kids and adults, as well as, for the eco-conscious, a clothing line made using organic cotton. Printed hats, bags, and other accessories also help to set this vibrant brand apart.